Two captains, one destiny. 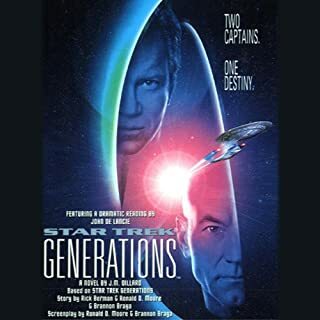 James T. Kirk - long thought dead - and Jean-Luc Picard must make the greatest sacrifices of their careers to save countless millions from a madman with a plan that could wreak mass destruction. Featuring a dramatic reading by John de Lancie and enhanced with sound effects and an original score! The first movie venture for 'The Next Generation' crew, is also a great book. Deeper storyline, superb sound effects, and masterful narration. An excellent book, and yet another worthwhile addition to my collection. 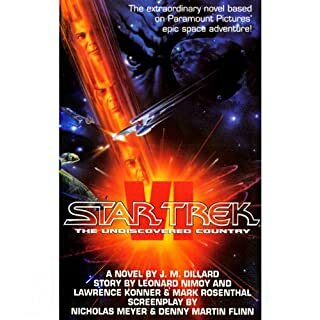 Kirk and McCoy are in the hands of the Federation's greatest enemy, the Klingon Empire is on the verge of collapse, and Spock and the crew of the Enterprise must uncover a deadly secret that threatens the galaxy. 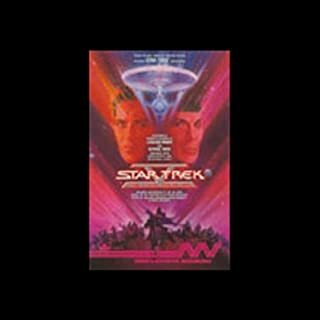 Featuring a dramatic reading by James Doohan and enhanced with sound effects and an original score! A great book, based upon the movie of the same name, but with more depth to the storyline, and how things developed 'behind the scenes' (so to speak). Nimbus lll is the site of an unprecedented attempt at cooperation among the Klingons, the Romulans, and the Federation. But terrorists seize control and it's up to Captain Kirk and the crew of the Enterprise to attempt a dramatic rescue. Read by Leonard Nimoy and George Takei, and enhanced with sound effects! If you've ever watched the movie, you'll also enjoy this. Having Star Trek actors narrating the story, adds to the atmosphere, and really brings the story to life. A great listen, and well worth buying. 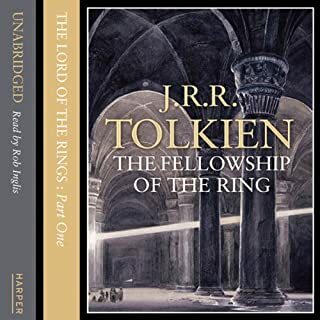 The Companions of the Ring have become involved in separate adventures as the quest continues. 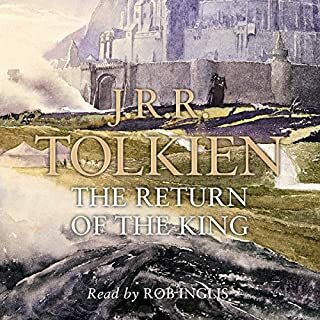 Aragon, revealed as the hidden heir of the ancient Kings of the West, joined with the Riders of Rohan against the forces of Isengard, and took part in the desperate victory of the Hornburg. Merry and Pippin, captured by orcs, escaped into Fangorn Forest and there encountered the Ents. And all the time the armies of the Dark Lord are massing. 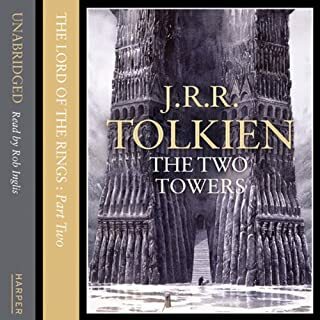 Frodo and the Companions of the Ring have been beset by danger during their quest to prevent the Ruling Ring from falling into the hands of the Dark Lord by destroying it in the Cracks of Doom. 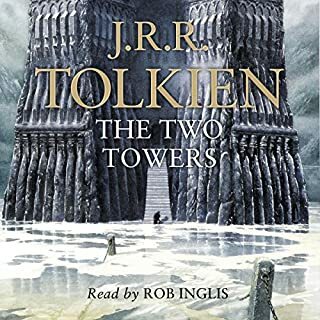 Now they continue their journey alone down the great River Anduin, alone, that is, save for the mysterious creeping figure that follows wherever they go. How can I review this? 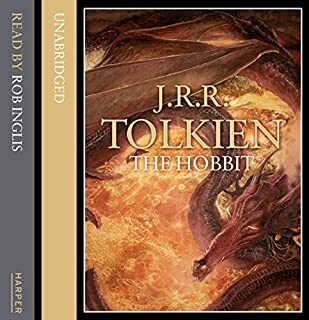 Whisked from his comfortable hobbit hole by Gandalf the wizard and a band of dwarves, Bilbo Baggins finds himself caught up in a plot to raid the treasure hoard of Smaug the Magnificent, a large and very dangerous dragon. Smaug certainly looked fast asleep, when Bilbo peeped once more from the entrance. He was just about to step out onto the floor when he caught a sudden thin ray of red from under the drooping lid of Smaug's left eye. He was only pretending to be sleep! He was watching the tunnel entrance! True to the original story. 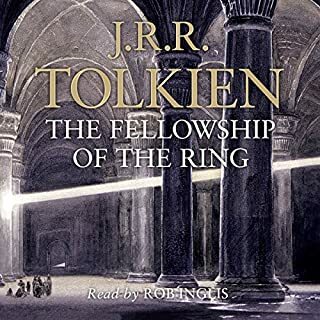 I've owned the printed version of this book for a number of years now, and from the moment I started reading it, I realised why it was called a classic. The 'Lord of the Rings' movies, only offer a mere hint of the legend that is Bilbo Baggins. The only way to fully appreciate this story, is to experience it through the book. 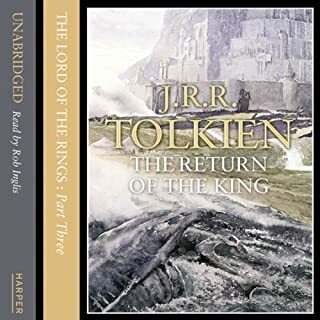 I'm hoping now that 'The Hobbit' movie will reveal the intricacies of the story, and offer a real look into, as the review title says, 'The Genius Of Tolkien'.